I’m back! And do I have some fun stuff to tell you about! In the last 2 weeks I have had some of the most stressful moments of my life but also some of the most special. Between winning Miss Pinup New Zealand and getting married, it would be safe to say that I have been living on Cloud 9! Because so much has happened, I definitely need to break it all up into several posts. So lets start with The Very Vintage Day Out and later, the Miss Pinup New Zealand Competition! 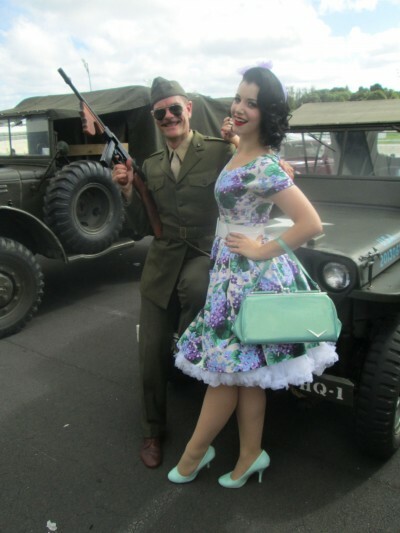 The Very Vintage Day Out was held on April 5th at Alexandra Park in Auckland. Now in it’s third year, the event was bigger and better than ever! The day for me started very early, doing my hair and makeup for the day, packing everything I needed for the competition and arriving at the venue early for a run-through with the rest of the contestants. Next on the agenda was the Photo Safari! This is a opportunity for models and photographers (either professional or amateur) to team up together and take photos with all the cars on show! It was so fun to meet so many talented photographers and get some amazing shots! The photographers submitted their favourites (you can see all the submissions here) and a winner was picked. The winning photo happened to be one of me, taken by Emma Joyce! Congratulations Emma! The military re-enactors were lots of fun! You may recognise Dapper Bruce from my Miss Pinup NZ Video Entry. I was taught how to hold one of their guns properly and was all anxious about accidentally setting it off, until I was told later that they were fake… Haha! They had also set up a awesome DIY photobooth inside- it was like a magazine cover from the 40s with lots of props to play around with. Now, my dress definitely needs mentioning! I saw this 2 days before VVDO and fell in love! It’s by a Wellington designer, Swonderful Boutique and stocked at The Yellow Brick Road in Ponsonby. The lovely owner of TYBR, Ruth, kept the shop open late so I could pick it up the night before. I paired it with my Hell Bunny White Petticoat, White Patent belt from Pinup Girl Clothing, lavender headscarf and Lux De Ville Handbag from Rita Sue Clothing and matching mint shoes I bought in Santa Monica last year. After the Photo Safari, we had another 4 hours to wait until the competition! My nerves were starting to build but luckily there was lots of things to look at and so many lovely friends to chat to. I even had some fans from Instagram come up to me and ask for a photo which was pretty special! 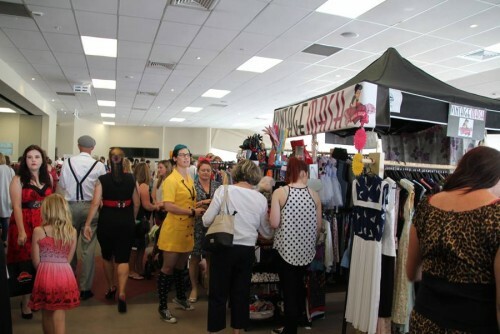 There was a huge range of stalls that included art, reproduction clothing, vintage clothing, shoes, accessories, a pamper parlour, latex and even a tattoo artist! Plus there was entertainment on the stage all day long. 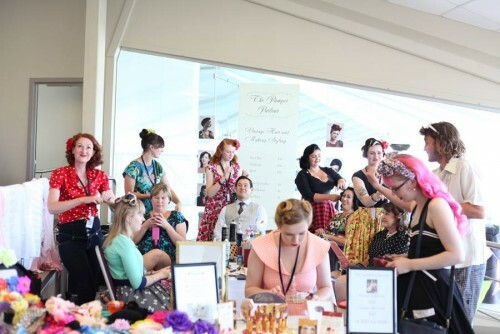 Big thanks to all the organisers of VVDO and Miss Pinup New Zealand, it is so much fun to have such a diverse event that looks like it will just keep growing and growing. The Miss Pinup New Zealand competition really needs a post of it’s own, so for now I will leave you with a few more pictures of the day. I am already looking forward to next year! My Journey to Miss Pinup New Zealand 2014! So cool! We have to get you to join us in the pamper parlour next year! How interesting! Your outfit is amazing, so glamorous. Congratulations!